The Arizona Fall League season ended on November 17th when the Peoria Javelinas beat Salt River for the 2012 AFL Championship. Hembree and the Scottsdale Scorpions finished second in the Eastern Division as the team posted a 15-16 record. Hembree, though, did not pitch in the final week of the AFL season. His last appearance came on November 10th when he threw one inning and allowed no runs or hits against the four batters he faced. The right-hander finished the fall season with 12 strikeouts and three walks over nine innings. He also held opponents to a .229 batting average against. Runzler’s 2012 season ended like Hembree’s: he did not appear in any games for Scottsdale entering the final week of the AFL season. The left-hander ended his fall season with 11 strikeouts and seven walks over eight innings. All seven of his walks occurred in his final four outings when he posted a 4:7 strikeout-to-walk ratio across three innings. Dominguez went 1-for-4 as the designated hitter in his last game with Scottsdale in 2012, keeping alive his nine-game hitting streak. He ended the season in a tie for the most home runs on the team with three. In six of his 10 games, he played left field while he served as the designated hitter in three games and played third base in one contest. Dominguez, who entered 2012 having played in 303 of his 334 career games as a third baseman, switched primarily to outfield during the 2012 regular season. He played outfield in 84 of his 92 games between Richmond and Fresno. In his only start of the week, Bonser suffered his second loss of the season after he lasted 1 2/3 innings in a November 17th start. The right-hander allowed two runs on three hits and three walks while striking out one. The outing was Bonser’s shortest of the VWL season. Lively was roughed up on November 13th against Cardenales de Lara. In what eventually became a 9-1 loss for the Bravos, Lively surrendered four runs without recording an out in the top of the eighth inning. The right-hander allowed back-to-back singles (including a bunt single) to start the inning before issuing a walk to load the bases. Lively then surrendered a two-run single to Jairo Perez, which forced Lively from the game. Silfredo Garcia spelled Lively, but Garcia proved just as effective when he allowed a two-run double to the first batter he faced (the runs were charged to Lively). Lively came back in his next outing on November 18th and did not allow a run over 1 2/3 innings. He struck out two in the November 18th outing, his first multi-strikeout performance in the Venezuela League this season. One of the Grizzlies’ most effective starters from 2012 made his VWL debut on November 16th, allowing one run and scattering eight hits over five innings. Petit would go on to suffer the hard-luck loss after the Bravos fell to Navegantes 1-0. In his second start, Petit threw five innings and suffered the loss once again. Only this time, Petit allowed six runs on six hits while striking out five and walking one on November 22nd. Machi made his VWL debut on November 13th, surrendering one run on two hits in a blown save. This set off a string of three straight outings – over three consecutive days – for Machi in which he blew a save opportunity. The right-hander took a couple days off, though, and returned to the mound on November 18th. He promptly struck out two of the three batters he faced in one inning of shutout baseball. In four appearances from November 18-23, Machi allowed one run over four innings to lower his ERA from 15.43 to 7.11. Since starting the season batting .419 through his first nine games, Linden has seen his batting average fall to .256 through November 26th. In his last 29 at-bats, the switch hitter has five hits (or a .172 average). However, Linden has proven his worth with an on-base percentage of .385 over that same 29 at-bat stretch, helped by eight walks and two hit-by-pitches. His 18 walks in 29 games are tied for third most in the DWL. Linden also added two home runs between November 20th and 26th, keeping him in second place in the league for most home runs with seven. Kieschnick has not appeared in a game since November 17th when entered the game originally as a pinch-hitter in the eighth inning. After striking out, he stayed in the game as a defensive replacement in right field, but he did not bat again. Over his last 20 at-bats, Kieschnick is hitless with two walks. Peguero, who along with Jean Machi were with the Giants but not active during the World Series run, played in his first game with Cibao on November 16th. He went 2-for-3 with a double, RBI and a walk. In his second game, Peguero went 2-for-4 with two doubles, an RBI and a stolen base. With the bar set high, he has cooled off a bit, going 4-for-27 from November 19th-25th – including a 0-for-8 performance during a 16-inning game on November 20th. Defensively, Peguero has played center field in all eight of his games with the Gigantes. The southpaw has not pitched since November 4th. Over two appearances last week, the right-hander did not allow a hit or a run in two total innings. The one base runner he allowed was via a leadoff walk on November 10th, but he successfully nullified the leadoff runner with three consecutive outs to pick up his second save of the AFL campaign. Each of Hembree’s nine appearances this season have been to end the game, which places him in a tie with three others for most games finished entering November 12th. The southpaw’s week got off to a rough start. He allowed two runs on one hit and three walks without recording an out against Mesa on November 5th. He also allowed another two runners he inherited to score in the game as a 3-1 Scottsdale advantage evaporated into a 5-4 loss after the four-run seventh inning. Runzler redeemed himself three days later when he did not allow Peoria to score in the ninth inning. The only issue: Scottsdale was already trailing 12-4 entering the ninth after Peoria erupted for 10 runs in the top of the eighth. Runzler did walk two batters on November 8th, giving him five over the week. He had two combined walks in his first eight appearances of the season. Dominguez only appeared in one game last week, going 1-for-5 against Mesa on November 7th. Dominguez’s hit occurred in his third at-bat and was a two-out single to load the bases. The threat ended one batter later, though, when Austin Romine struck out. Strikeouts were a theme for Dominguez during the game as he struck out four times, adding to the 12 total strikeouts by Scottsdale batters in the 4-3 loss. Bonser made one start last week, allowing two runs on six hits over six innings against Tigres de Aragua on November 7th. He did not walk a batter in the start – a first for him in an outing with Margarita this season – while he struck out four. The start was Bonser’s second straight outing of six innings pitched. Bonser is 10th in the league with a 3.13 ERA. Lively’s first outing of the week was on November 7th in relief of Bonser. If you noticed, Bonser did not factor into the decision. That is because Bonser left the game with a 2-2 tie. Lively, however, did factor into the decision: a loss. Lively entered the seventh inning and struck out the first batter he faced. Lively walked the next batter, Rossmel Perez, and then surrendered a double to Carlos Colmenares that plated Perez. Lively was subsequently removed and was eventually tagged with the losing decision in the 3-2 game. It was his only appearance of the week. Linden went 3-for-16 at the plate in five games last week. He did walk five times, though, giving him 12 on the season and helping him maintain a .400+ OBP. On November 6th, Linden hit his fifth homer of the season, which places him second in the league in that category. His 12 walks are also second most in the league, trailing teammate Felix Pie. After going hitless in his first game of the week on November 5th, Kieschnick enjoyed a three-game stretch between November 6th-9th in which he went 7-for-11 with one home run, four RBIs and seven runs scored. His week tailed off after he went 0-for-12 with four strikeouts in the final three games. Kieschnick reached base one time in his last three games of the week, an intentional walk on November 11th. His team-leading 18 RBIs are second most in the league. The southpaw did not appear in any games last week. The right-hander threw his fifth scoreless outing of the season in his first appearance of last week, but in his second game, he surrendered two runs on three hits in one inning on November 1st. Before his November 1st outing, Hembree had a 1.50 ERA and .217 batting average against in his first six games of the AFL season. Overall, Hembree has 11 strikeouts against two walks with Scottsdale. The left-hander made only one appearance last week, and he allowed a run for the first time in the AFL season. He surrendered one run on two hits, one walk and one hit batsman in one inning against Phoenix on October 31st. Against left-handers, Runzler has a .400 batting average against (4-for-10) while he is limiting right-handers to a .077 average against (1-for-13). After his regular season was cut short due to injury, Dominguez has been playing every few days for Scottsdale, including two games last week. He went 4-for-8 with a home run and two RBIs over the two games. After going 0-for-5 in his AFL season debut on October 10th, Dominguez has a hit in each of his last seven games, batting .407 (11-for-27) over the stretch. The right-hander made one start last week, holding Cardenales de Lara scoreless over six innings. Bonser struck out five and walked one while also hitting a batter in the start. The five strikeouts were more than he had recorded in his previous three starts combined. The Grizzlies’ bullpen innings leader from 2012 made three appearances last week, allowing one run over 1 2/3 innings. In his last appearance of the week, he allowed two runs (one of which was an inherited runner) in his first loss of the season. After posting a .407 batting average in his first eight games of the Dominican League’s season, Linden went 4-for-19 in seven games last week. Two of the week’s four hits came in the October 29th game when he hit two solo home runs. Entering November 5th, Linden is seventh in the league in batting average, fourth in OBP, third in slugging percentage and second in home runs. Kieschnick is pacing Escogido in hits, home runs, RBIs and runs scored so far this season. His 12-game hitting streak to start the Dominican season was snapped last week after he went hitless for the first time on November 2nd. He drove in five runs (despite going 1-for-3) on October 31st and followed that performance up on November 1st by hitting his third home run of the campaign. The southpaw appeared in one game last week, suffering the loss after not recording an out against the three batters he faced on November 4th. Rodriguez allowed one unearned run on two hits in the appearance. Rodriguez, who threw one inning or more in 29 of his 37 games with Fresno in 2012, has only lasted a full inning in a single appearance once with Escogido. Nick Noonan had a memorable day on May 20th at Round Rock after going 4-for-5 at the plate. Two of his four hits were home runs, including his first career grand slam. The part of his day that stood out the most, though, was his 8 RBIs, the most ever by a Grizzlies hitter in a single game in the franchise’s 15-year history. 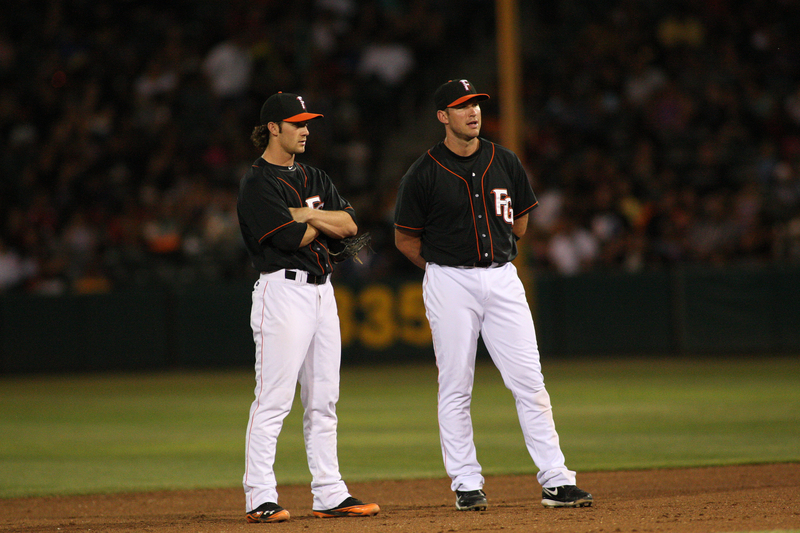 Noonan and Conor Gillaspie each matched the Grizzlies’ team record for hits in a single game with five each. Noonan had five hits on June 12th versus Sacramento at Chukchansi Park, and Gillaspie recorded five hits on April 21st at Tacoma. On May 22nd, Francisco Peguero became the first Grizzlies hitter since Michael Byas (2002) to register two triples in a single game. Peguero ended his season with the Grizzlies with 10 triples, which tied Nate Schierholtz (2008) for second-most triples in a single season in Fresno history. With the help of Peguero’s 10 triples, the Grizzlies set a franchise record with 48 triples for the entire season, surpassing the previous record of 43 set in 2006. The 48 three-base hits were third most in the PCL. Justin Christian and Brock Bond each set themselves among the Grizzlies leaders in batting average and on-base percentage with their 2012 performances. Christian’s .343 batting average ties Tyler Graham (2010) for the third best clip in a season. Bond’s .332 average and .422 OBP are tied for eighth best and fifth best, respectively, in team history. A couple of records set that were lowlights for the season include fewest team stolen bases (64) and grounded into double plays (134). Todd Linden returned to the Grizzlies in 2012 for his sixth season in his career after spending the last 2 1/2 years away from affiliated baseball. The switch-hitter spent the entire campaign with Fresno and established himself as the leader in most offensive categories for the franchise’s career leaderboard. Linden is first in games (558), hits (563), doubles (117), triples (19), home runs (83), RBI (310), runs (361), walks (267) and strikeouts (529). 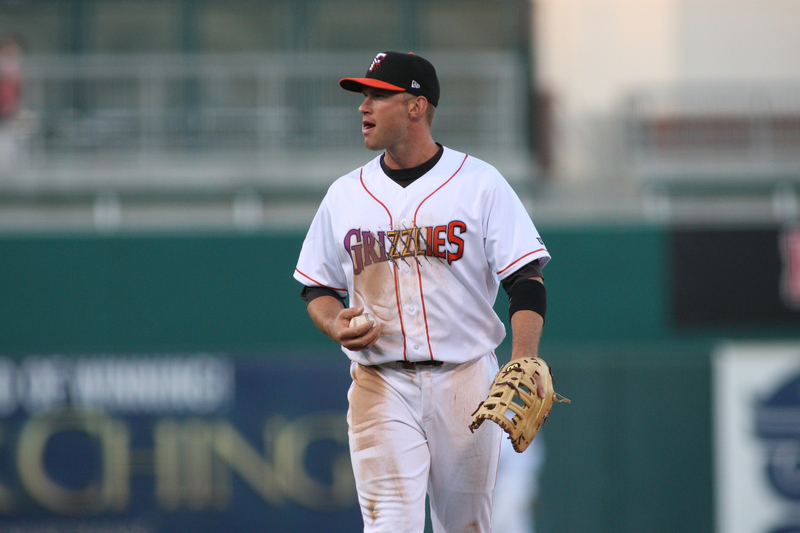 Eric Hacker also returned to the Grizzlies in 2012 after spending the 2010 season with Fresno. The right-handed pitcher moved up the franchise’s career leaderboard in wins (3rd with 28), strikeouts (9th with 232), starts (4th with 54) and innings pitched (7th with 316). Another pitcher, Yusmeiro Petit, placed his name among many several single season Grizzlies record boards in his first year with Fresno. The right-hander struck out 153 batters, which is the third most ever by a Grizzlies pitcher. He only walked 36, helping him tally the franchise’s best K/BB ratio (4.25). Meanwhile, his 166.2 innings pitched are ourth most thrown by a Grizzlies pitcher in a season. Jean Machi and Heath Hembree each had 15 saves, which are tied for seventh most in a season by Grizzlies pitchers. It was also the second straight season in which two Fresno hurlers each had 10 or more saves. Marc Kroon and Dan Otero had 20 and 12, respectively, in 2011. While the Grizzlies are locked in their battle for first place in the Pacific Southern Division, the Albuquerque Isotopes are also fighting off a close second-place opponent, the Oklahoma City RedHawks, in the American Southern Division. Fresno is ahead of Sacramento (29-15) by 1.5 games despite the Grizzlies being the only team in Triple-A with 30 wins. Albuquerque, meanwhile, leads Oklahoma City by a half game. The RedHawks are 24-19. On a related note, PCL playoffs are 107 days away. The Grizzlies lost the last three games against the Isotopes in 2011, but Fresno won the final three games last played at Isotopes Park between the two teams in 2010. Either way tonight is going to extend some sort of winning/losing streak: four consecutive losses to Albuquerque or four-straight wins against the Isotopes in Albuquerque. Only three players who played in the final game of 2010 between Fresno and Albuquerque are still on the Grizzlies’ active roster today: Brock Bond, Jackson Williams and Eric Hacker. Todd Linden is coming off an impressive four-game series at Round Rock. The switch hitter went 12-for-18 (.667) with three doubles, two home runs, nine RBIs and nine runs scored. Linden has driven in a run in five consecutive games, giving him 35 RBIs on the season. He has also scored three runs in each of his last three games and recorded multiple hits in the last four contests. A walk-up/warm-up song for a baseball player can be a very picky process. Players want a song that pumps them up and could help them focus for the task at hand. Some players care a lot more than others when it comes to narrowing down a song. A select few don’t even bother choosing one. The songs can range from the obscure to more well known, the newer to the older, the serious to jokester. Below are a few of the songs chosen by the 2012 Grizzlies for this season.